We’ve been traveling for over NINE MONTHS now! What a collection of diverse experiences we’ve had so far. It’s hard to believe we still have about another seven months to go of long-term travel (but it is exciting to think about)! Overall, we’re doing great! We have so many takeaways and have personally benefited tremendously and profoundly from what we’re choosing to do. We’ve developed more as individuals and as a couple; this trip has truly impacted and forever changed our lives. Needless to say, we still are not regretful about the decision we made to save our money, quit our jobs, not renew our lease on our house, and travel long-term together! In keeping up with this trend I started of checking in every few months on the blog to recap what I’ve learned and realized based on what’s been happening lately, here’s my latest batch of thoughts to share. 1) This feels like our regular lives now. The novelty of living life on the road away from our home has long faded; this feels normal, even though we know this period of time in our lives isn’t going to be ongoing and won’t last forever. We plan to return to living in Sacramento to start a new chapter where we live, work, and gradually build our future together, but in a new way, different from what we left behind before we started traveling and inspired by what we’ve gained from our time away. When we will look back, we realize what now feels like a lengthy adventure will come to be a short time in our lives we will reflect upon meaningfully and fondly. In fact, we’ve been reminded of this by friends who have done something similar, who now have a home they’ve settled into and a toddler, another great life journey to be had. So, we are mindful to soak up our environments, experiences, and lifestyle wherever we are, not taking it for granted. 2) We are strong proponents of slow travel. Upon landing in Athens in early April, we started a new type of travel style that we’d been long looking forward to and had been ready for. Being able to settle into a place as if we actually live there, for weeks at a time. Emptying most of the contents of our backpacks into closets and onto shelves and tables. Not moving for awhile. Becoming familiar with our surroundings enough to not need to rely much on maps or our phone, except when wanting to explore new areas further out. Figuring out our favorite coffee spots, bakery, and deli and having the time to return to them. Having a fully-equipped kitchen and access to a nearby grocery store and weekly farmers’ market to be able to enjoy cooking good food for ourselves. Getting into a regular exercise routine at a local gym (me) and outdoors (Aaron, for running). Embarking upon solo activities more often than usual. Meeting local people to greet and see on a regular basis. Comforts of home that make it feel home-y, like we are actually living in a place like locals vs. being tourists. Not chasing popular sites to see, but instead exploring by foot to see what we find around us, and get a feel for what real life is like for people in a place. 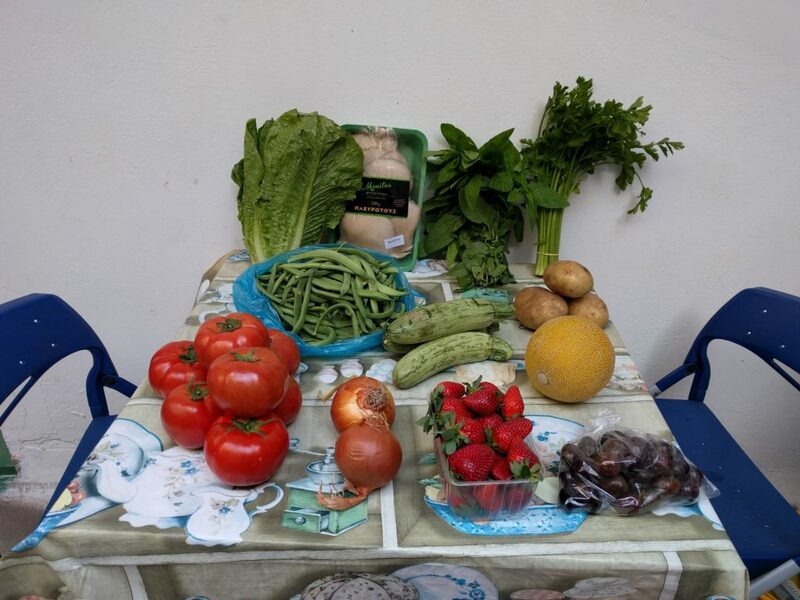 Our first procurement of fresh produce from the Saturday Farmers’ Market in Exarcheia, the neighborhood we primarily stayed in for the month or so we were in Athens. I think this type of travel, where I feel comfortable and am in a daily routine of just living, doing basic, every day things, has contributed to my general lack of homesickness lately, despite being away from family, friends, and our lives back home for such a lengthy period of time. Also, it’s long been a dream of mine to be able to just pick up and live in another, random city for a month (away from home), to experience what it’s really like there. I’m happy to say that I’ve now done that and will continue doing so in foreseeable future! Part of my walk to my Greek language classes – Real life happening on the streets of Athens! Traveling slower has been great for our budget, too, allowing us to extend our journey longer than we had initially planned on! Most of our AirBnB accommodations offer weekly or monthly discounts, and we are self-catering most of the time, limiting how often we dine out. 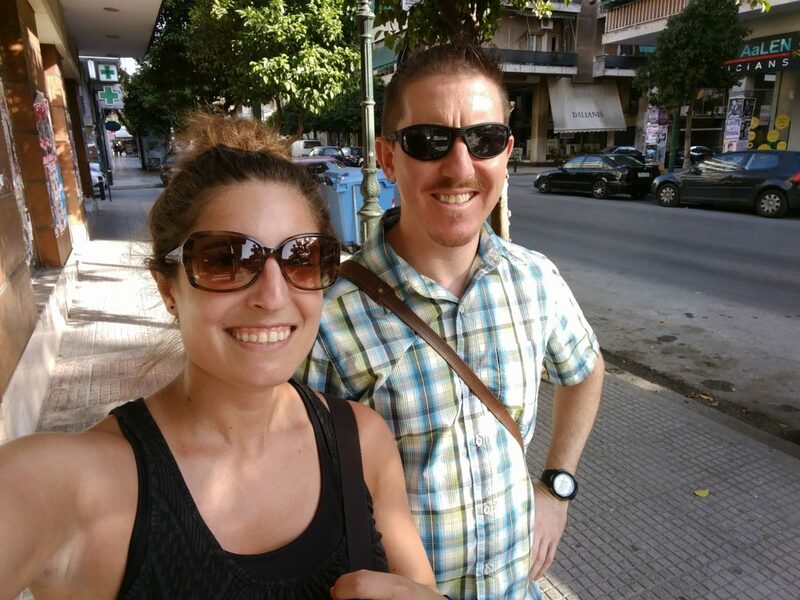 We’ll be house and pet-sitting for a month near Monemvasia in the Southern Peloponnese of Greece through HelpX and six weeks in Sandhills, a town near London in the UK, through Trusted Housesitters, so our accommodations in both places will be free in exchange for our services while living in the homes of locals. 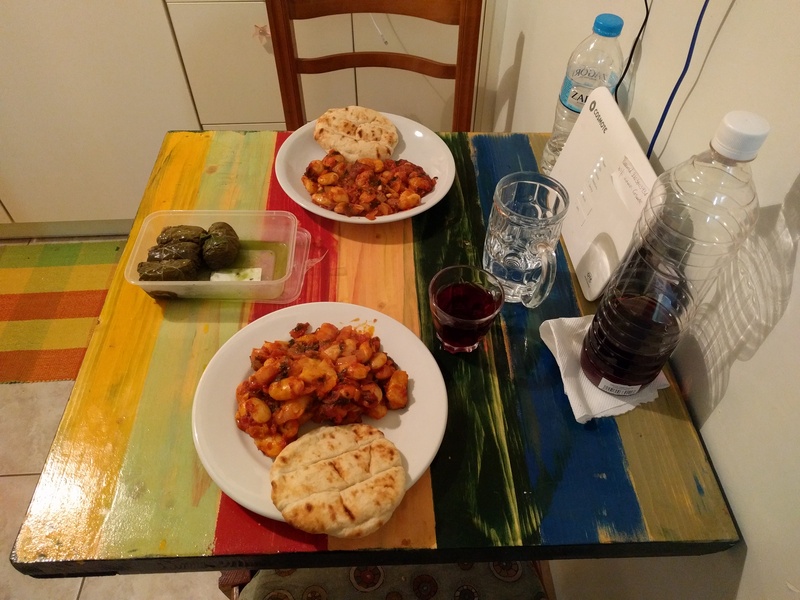 Gigantes – One of many traditional Greek dishes we made while living at our apartment in Exarcheia. 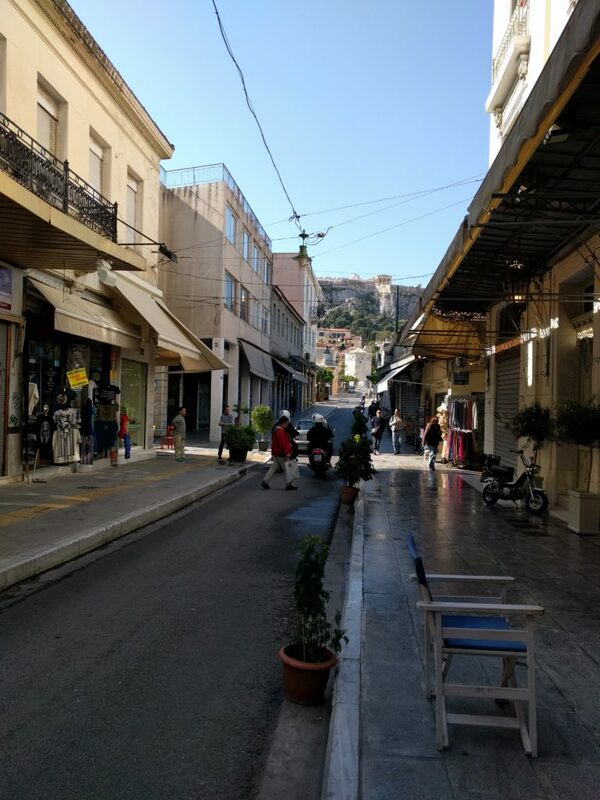 We bought the dolmathes at a deli next door to our first apartment in Kolonaki, the neighborhood we stayed in upon our arrival for our first few days in Athens. The table wine (yes, in a water bottle!) was from either a small local vendor market we stumbled upon over the weekend in the main square of Exarcheia, or a specialty goods shop, and the pita bread was from yet another small, local shop we passed on one of our walking excursions to explore the city. Slow travel has a more relaxed vibe to it that resonates well with us at this point in our journey. We’re glad we’ve visited the parts of the world we have in the order we chose to visit them. Aaron chillen at a cafe in Exarcheia. Outdoor seating is the norm; often times, restaurants and cafes are nearly empty inside, as most people take their eating and drinking outside. 3) Traveling in Europe is much easier than traveling through Mexico and Central America overland (not more rewarding, but more comfortable). For example, food and water safety concerns are pretty much nonexistent where we’ve traveled in Greece and Cyprus, and we anticipate we can expect to encounter more of the same in the UK. It’s also generally more expensive, but we’ve figured out ways to make it affordable (see #2 above). I feel much more comfortable walking around on my own, too. I haven’t had to endure any long transit van or bus rides, or ride unsteadily in the back of pickup trucks, on undeveloped roads lately, either. In fact, the most prominent discomfort these days that comes to mind is tolerating cigarette smoke pretty much everywhere (i.e. in restaurants and cafes indoors and outdoors, on the street, etc. ), because pretty much everyone smokes in this part of the world (hey, I’ll take it in comparison to other things we’ve encountered in our travels). However, it is highly evident to us that our opportunities for meaningful, cultural exchange are far more limited and less in-depth where we are now and where we’re headed than where we were six months ago in Guatemala, or even a couple of months ago in Thailand. 4) Hot, humid weather is not for me. I already knew that, but more like, moving forward, I’m not going to choose to travel to places where I’ll have to contend with it, suffering through it to be able to experience what is around me just because I want to go there. Our time in Thailand taught me this especially. While I’m glad we went and our experiences there were rewarding, would I do it again during one of their hottest times of year? Likely not. After wrapping up our long, challenging bouts of overland travel in Central America, where we often also encountered hot and humid weather, I was ready to be more comfortable, but I also was ready to experience a culture so different and unique than anything I had been exposed to before. 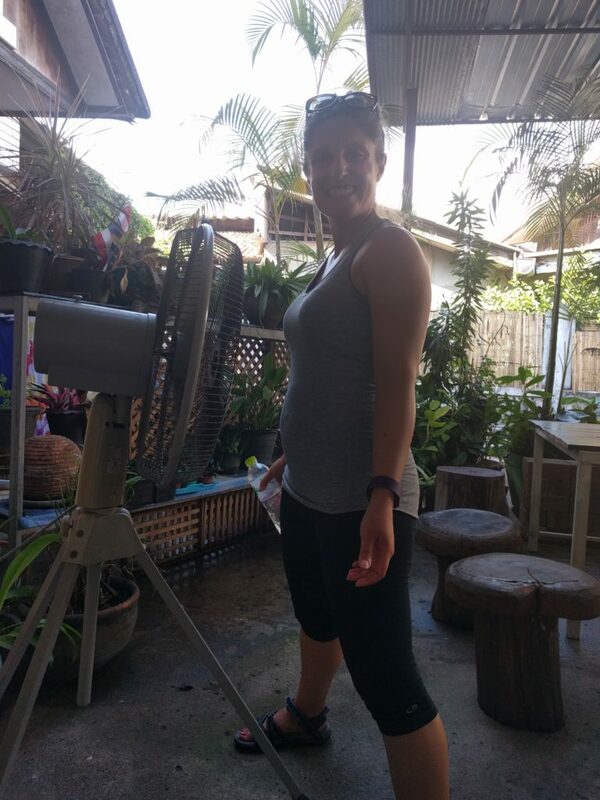 Dealing with the relentless, humid heat in Thailand was very challenging for me and it did affect my experience. As such, we are planning our upcoming travels accordingly; there are many places in the world we can go this time of year with milder, more pleasant, climates. Hence, the cooler temperatures the UK typically experiences in August sound so delightfully inviting to me, whereas most who live there choose to go on holiday in pursuit of warmer weather at that time! 5) It’s impossible to see the whole world in a year. Not like we are trying, and not that it was ever our expectation, but it’s worth saying. Even if you dedicate all of your time to it, and travel rather quickly through places (i.e. spending only a day or two in each place). Even if you spent two, or three, or four years traveling long-term and non-stop. The world is HUGE and there are an endless amount of places to see and things to do, when you consider not only countries themselves, but what is beyond the popular tourist destinations and/or sites out there within them, which is what we’re interested in experiencing. While this is our once-in-a-lifetime chance to travel like we are right now, it’s impossible to visit all the places we want to go within the time we’re traveling, and that’s okay! (Admittedly, I have to remind myself of this sometimes). We’ve had to make trade-offs, such as not going to South America at all, because we’d spent so much time in Mexico and Central America, to make it to Thailand and then to Greece before Pascha (Easter). Our strategy has been more to fully embrace wherever it is we are, and as much as possible, experience it thoroughly and beyond the surface, rather than rush through to say we’ve been there and try to check off as many places as we can off of a list. The result has been more fulfilling travel experiences. We’ve tried to prioritize places we may not otherwise go on a regular, one or two-week vacation in the future (although, we have identified a handful of places we went and would return to, and barring unexpected life circumstances, it’s almost a guarantee that we’ll go back to Greece). It’s also notable that we’ve changed our original outline of where we thought we’d go and have ended up (or will end up) in places we didn’t initially plan on going to as well, based on developments in our travel research (i.e. finding out we can only be in the Schengen countries in Europe for 90 days within a 180-day period). For example, while we likely won’t be able to explore some of the countries we wanted to in the Schengen, we’ve instead come to Cyprus and will spend some time in the UK, which weren’t places we’d planned on visiting on this long-term travel journey of ours. 6) Progressing with my Greek language skills has been a greater challenge than I had initially anticipated. 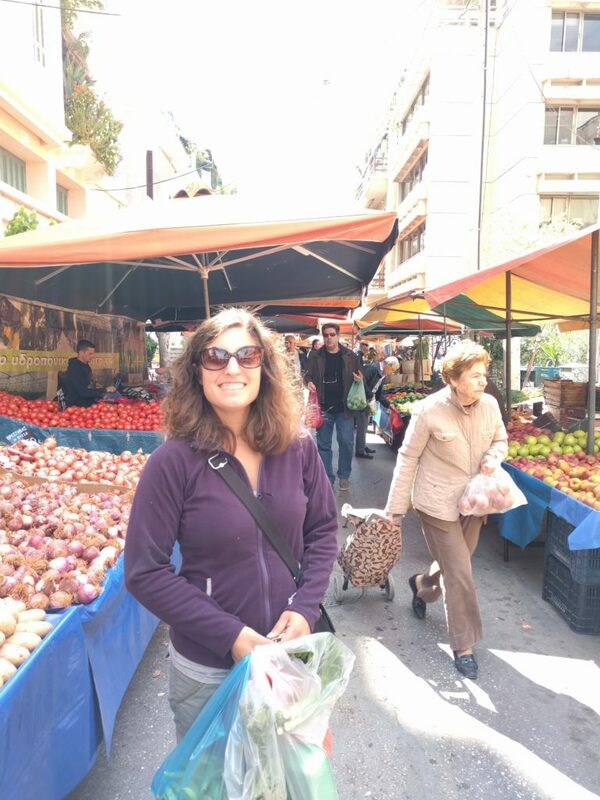 I was so excited to live in Greek-speaking countries for two to three months (Greece and Cyprus) and have the opportunity to practice and improve on a daily basis. I had assumed my experience would be similar to that of Mexico and Central America, where I often encountered situations where those I communicated with spoke little to no English, so my developing Spanish language knowledge and skills were necessary to use. Not to mention my three weeks of one-on-one tutoring, five hours per day for five days per week, in Quetzaltenango (Xela), which significantly impacted my progress. And in a lot of places we visited (although not usually in big cities), locals were patient with us as we sometimes struggled through what we were trying to say. Perhaps it’s still too early to judge, since we’ve only lived in Athens and are visiting Larnaca this week and haven’t yet driven through small towns and villages where English may not be widely spoken. But, in my experience so far, most people speak fluent English, and are insistent on speaking it to me, even if I let them know I’m learning Greek and try to communicate in Greek to them (I often get responses in English). It’s been disappointing and frustrating. 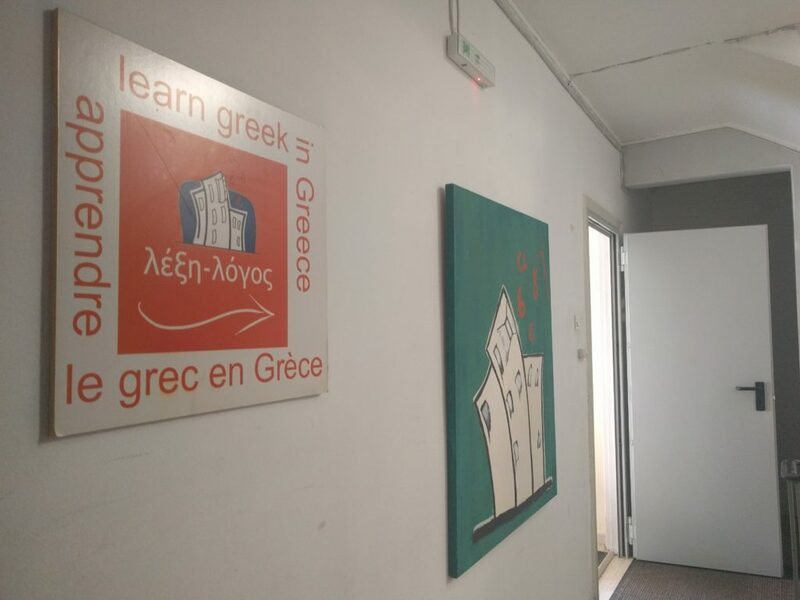 I took a Greek language class twice per week for two hours at a time while we were in Athens, but I was placed in an intermediate mixed-level class, and most of the class had been studying progressively together since January. Needless to say, there’s a lot I had missed and hadn’t learned in my prior Greek language classes back in the U.S. (I took two years of group classes, starting at a beginner level, after returning from our two-week vacation in Greece back in 2012), so despite my diligent efforts to get up to speed outside of class (which was stressful and time-consuming), and although I did learn in every class I attended, I mostly attempted to self-teach myself based on the materials in the books I was provided, with no one to review it with (although I still learned quite a bit in this way). Add to this that Aaron was also at a similar proficiency level and also learning right beside me when we were studying Spanish; we often practiced speaking Spanish together, tested one another on memorizing vocabulary and verb conjugations, and were both engaged when interacting with others in Spanish (if one of us didn’t know how to say something or didn’t understand something written or spoken, the other might). In contrast, I’m all on my own here! In any case, I’m not giving up, though I feel discouraged, and am hopeful I’ll have more opportunities to learn and practice throughout the remainder of our time in Greek-speaking countries, and when I return home to the U.S. I am grateful for those I’ve met who have been willing to communicate with me in Greek to help me practice, like the sweet lady in the bakery near our apartment where we bought treats throughout the week! I am continuing to remind myself that becoming fluent in a language, or even, conversational, can take years unless you are fully immersed in it, only speaking and hearing that language constantly, so I’m committed to this long-term and will continue to slowly build upon what I’ve learned so far. I feel it’s important as a part of preserving my cultural identity and connects me more to my heritage and other Greek people, as language has a powerful way of eliciting feelings of commonality. It also fondly reminds me of my grandparents (my mom’s parents) since they spoke the language fluently to each other, around us, while my sister and I were growing up. I can’t explain the special feeling I experience when I hear a song my Yiayia used to sing to me as a child, like I did on a street in Athens recently that made me stop and listen to its entirety, or a word or phrase she or my Papou used to say. Or hearing something they used to say that I didn’t know the meaning of, and learning what it means. 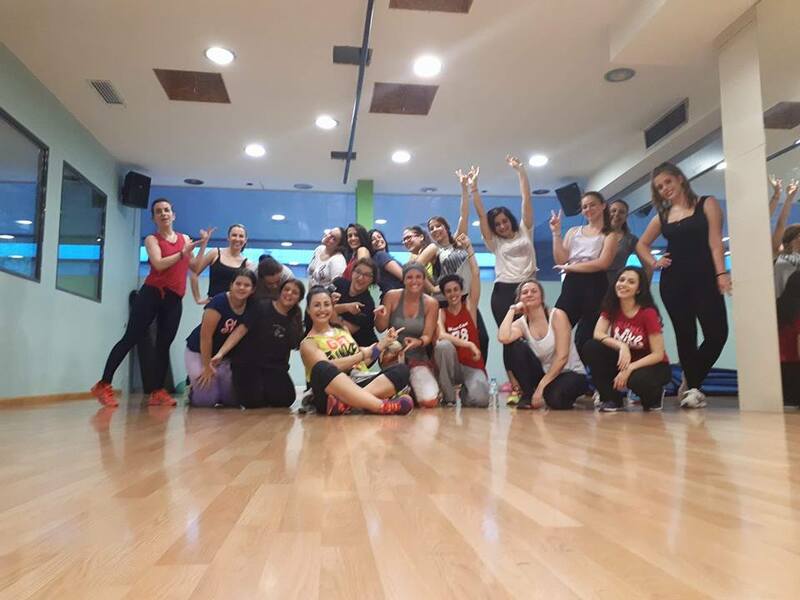 7) I feel so happy and fortunate to have the unique opportunity to meet and get to experience group fitness classes taught by instructors around the world! It’s so cool! It benefits me not only personally, but for my fitness career as well, being able to continue developing as an enthusiast and trainer through learning from my peers throughout the U.S. and in Mexico, Guatemala, Nicaragua, Thailand, Greece, Cyprus, and more places to come! I also love when I get asked to share some of my own music and choreography with the instructors and their students that I meet! It’s fun to show my own flavor, represent (to them) instructors in the U.S., contribute to the class experience, and be able to teach from time-to-time (which I miss and it keeps me fresh)! I look forward to sharing a piece of so many instructors with my own students at home through some of their music and choreography I’ve picked up (with fond memories attached to them) throughout my dance fitness adventures while traveling! On a more personal note, I’ve been able to make local connections through meeting instructors and students in the classes I’ve attended. It feels so good, being in so many different places, to make some friends to look forward to seeing and interacting with. 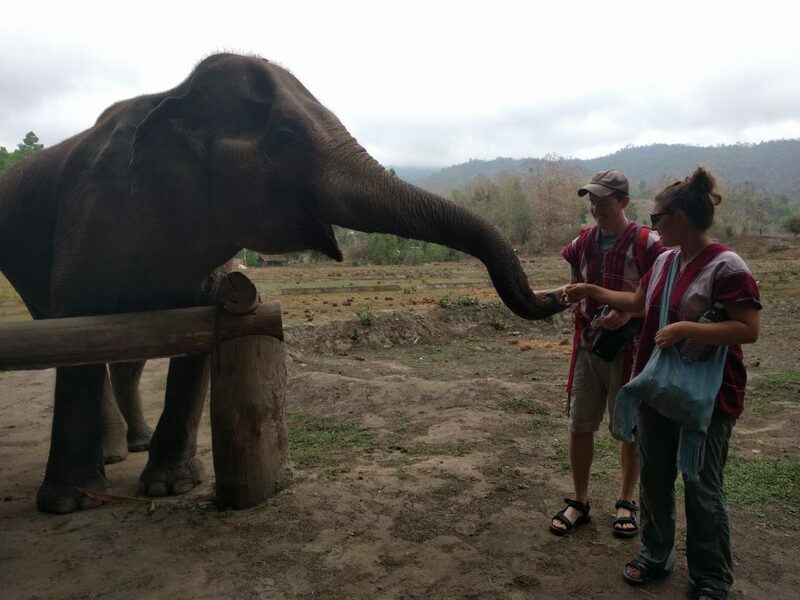 Whether getting tips about what to see, do, or eat in the area, sharing a bit about me and learning a bit about them, or just being able to give a greeting and smile to a familiar face, these are all things that have enhanced my travel experiences by far! 8) The time difference from home is a tricky adjustment in Asia and Europe. While in Mexico and Central America for five months back in late September through February, we were on Central Time, which is two hours ahead of California and one hour behind Aaron’s parents in New York. We could connect much easier with friends and family back home. After our two-week visit to the U.S. back in late February/early March, we flew over the International Date Line. We were fourteen hours ahead of California time while in Thailand for the (almost) month we were there, and we’ve been ten hours ahead of California time since arriving in Athens. There is a small window of time when we’re awake at the same time everyone else is back at home, otherwise we’re in what I call “the dark hours”, where we’re awake and everyone else is sleeping. Also, most of our friends and family work during the week, and we are often out and about wherever we are; so just because it’s a time of day when we’re both awake, doesn’t mean we’ll be able to easily connect. Texting, calling, or emailing our families takes some coordination, although really they are happy to hear from us anytime. Video chatting with them or my close girl friends takes some time to set up, too. Sharing photos on social media takes planning, because if we post at noon our time, no one in the U.S. will see it unless they wake up in the middle of the night and start scrolling through their feeds. We’ve gotten used to it, but it took some time to figure it out and just know off the top of our heads what was what. 9) If I could choose anything in the world to be doing, this would be it. When I think about the cliche of living life to the fullest, I feel like I am. If I were to die young, I would look back and be so glad we made this long-term travel journey happen for ourselves. Every day isn’t easy, although there are less challenges these days that we encounter since we’re moving slower and researching and committing to travel plans further in advance, but they still happen and we still work through them. Inconveniences are coupled with the awesome, fully enjoyable experiences, similar to how every day life works for most people generally. 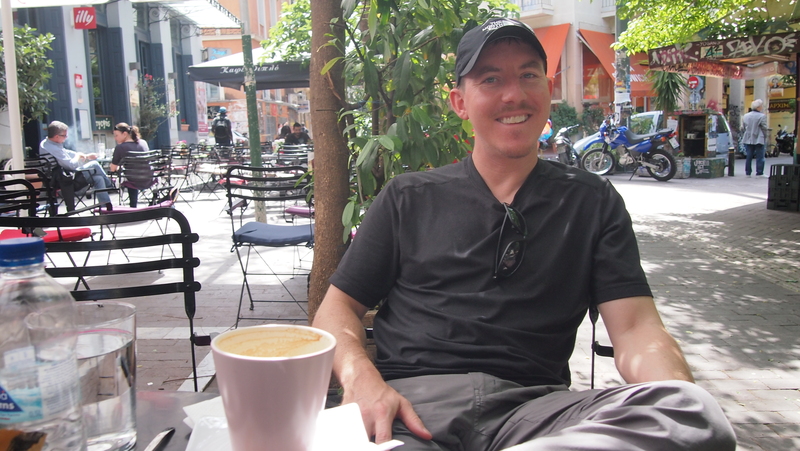 This leg of our trip has brought more comfort and leisure, such as enjoying lattes in cafes almost every day and sleeping longer hours (which we soaked up while it lasted in Athens but have started getting up earlier in Cyprus). Some places are more like vacation destinations, other places are more urban, others are more remote and rural. Some encounters are not enjoyable and test patience and endurance to get through. Some days consist of not doing much of anything, which feels nice. Other days we fill our time with a lot of activity, usually walking around exploring our surroundings. Some parts of everyday life can feel stressful, like running around to multiple places to procure items we need, just like it can at home (I’ve come to realize recently though, I think the caffeine from all of our coffee consumption has something to do with this feeling). Encountering so many different people who speak so many different languages and have so many different religious beliefs and cultural customs and eat so many different types of food is so fascinating and unique to get to experience first-hand. Not that I wasn’t before, but I am even more so observant, open, understanding, and respectful of how people live these days. We realize it’s impossible to share everything we see and experience, but we hope what we are sharing is helping our friends, family, and those connected to us get a feel for some of the exposure we’ve had to learn about different cultures in countries in various parts of the world, depicting real life where we are and as we see and experience it, and what our long-term travel lifestyle is all about. 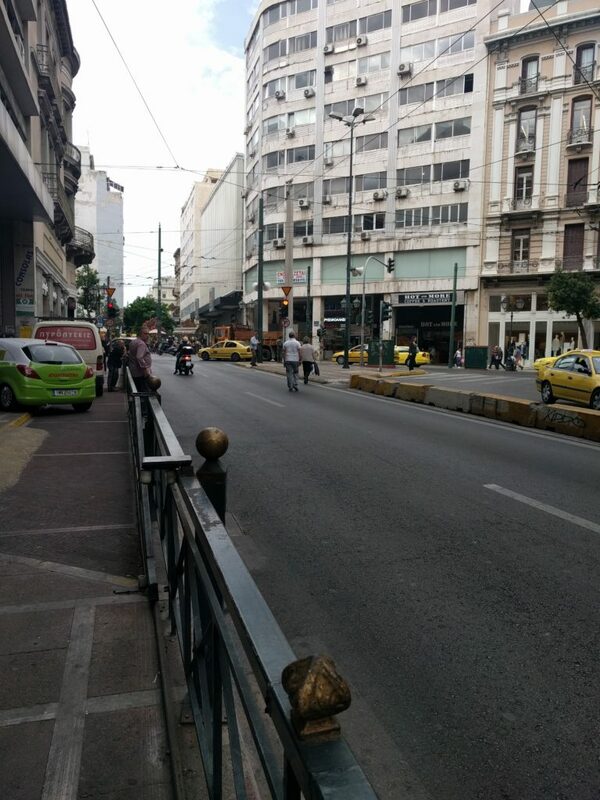 Wandering the streets of Athens with a Cappuccino Freddo in-hand (coffee, of course)! 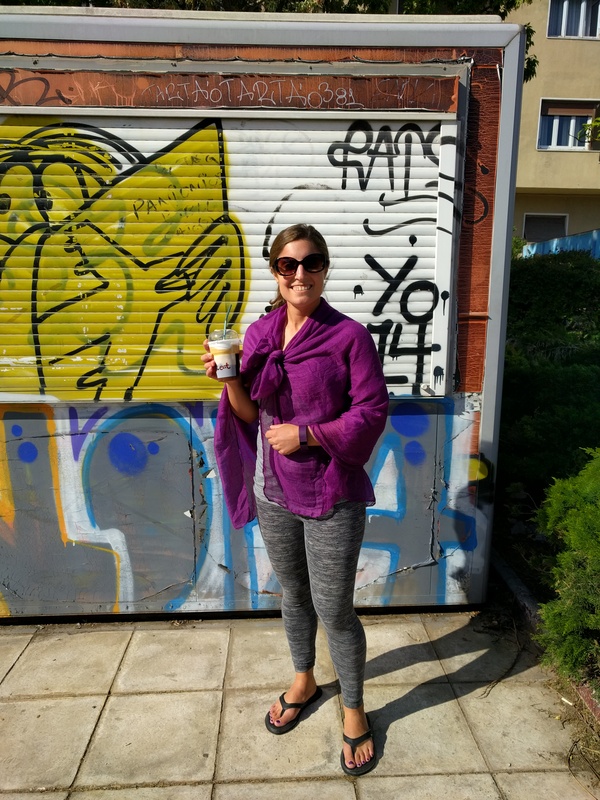 Take-away coffee exists in Greece, but it’s got more of an international and trendy feel to it; sitting and enjoying coffee at a cafe with friends, taking your time, is more commonplace and traditionally Greek (which we most often did ourselves)!